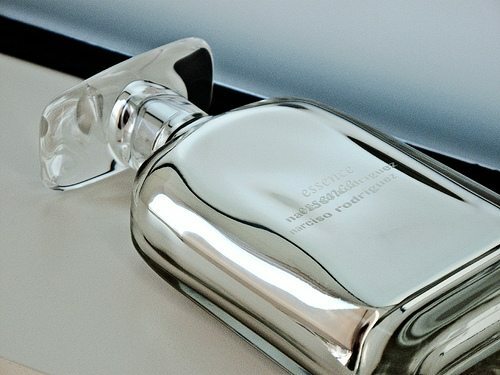 Top of the wish list is the Prestige limited edition of Narciso Rodriguez’s Essence, which captures the perfume’s signature musk, iris and rose notes in a truly, utterly, fabulously gorgeous bottle. 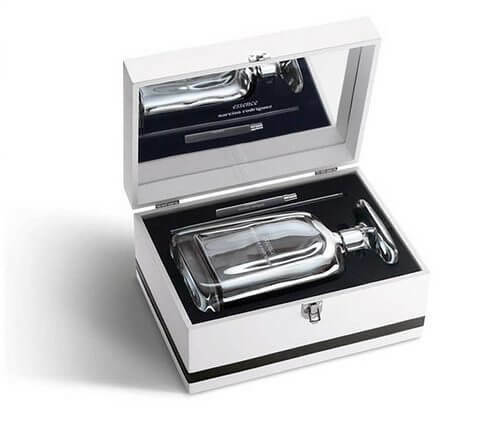 Designed by Ross Lovegrove (holder of numerous international awards and exhibited everywhere from the Museum of Modern Art in New York to the Pompidou Centre in Paris), the one litre bottle (yup! that’s a lot of perfume!) is essentially a sculpted glass sheath draped over a silvery, mirrored core – curvy, organic and haute in a SoHo art gallery kind of way. The mirrored surfaces also mean that the bottle picks up the colours and patterns of its surroundings, then bends and twists them to create an impression of constant motion. Yes, the Rodriguez Essence has certainly gone to a lot of trouble getting dressed up, and won’t look amiss placed as a sculpture in the drawing room. And that’s not even all: The one litre bottle is nestled in an ultra-feminine, handcrafted jewel box that’s inspired by the couture universe of the New York designer. A small handbag size spray (10ml) and the matching pipette (for refilling) completes this uber-luxe coffret. There is just one catch – the Essence Prestige Edition is limited to only 200 coffrets around the world. And the price tag to get this amazing piece-of-art is a cool Rs. 1,25,000 ($1,950/€1400). I know from a trusted source that one bottle is up for grabs in India. So run, don’t walk! « Monday morning mood makeovers!